I think I’m a little late to the savory oats trend. 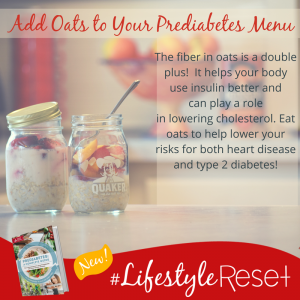 I decided to explore oats as a dinner side dish to get more variety of fibers in my diet. And it turns out that putting a fried egg on this dish turns it into a delicious light entrée for dinner or an energy-sustaining breakfast. Savory Oats and Lentils provides the fibers that are good for blood sugar control and cholesterol management. You see, not all fibers are the same. And I’m especially interested in the types that are good for blood sugar management and cholesterol levels. Enter oats and their beta-glucan. And I pair that with lentils for their resistant starches and viscous fibers – also good for blood sugar management and cholesterol levels. Really this recipe hits a healthy food group trifecta: you’ve got legumes, whole grains and vegetables all in one pot! Serve this as a side to baked chicken or fish or even as a lighter entrée with an egg. 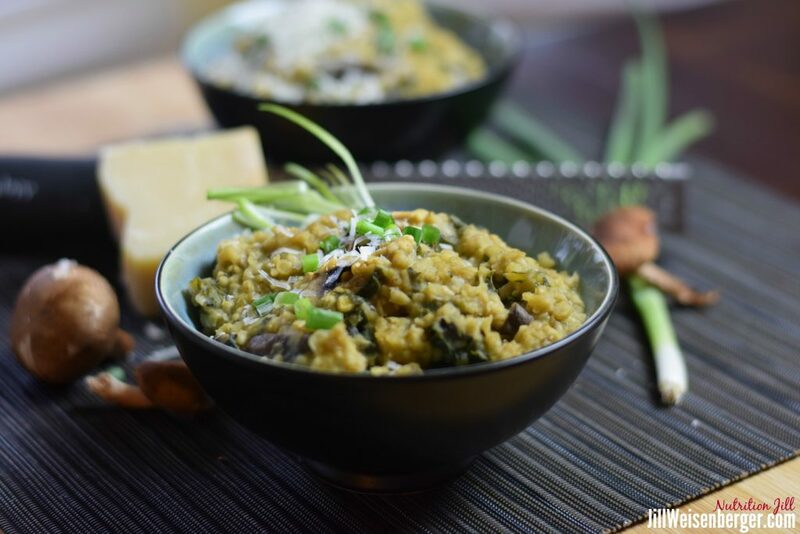 The oats and red lentils combo worked out so well that I’ve tried it a few times. Check out Creamy Oats and Lentils with Sweetly Spiced Apples. Yum! And as long as we’re talking oats and breakfast, be sure to try overnight oats. You get to make up the recipe. Layer the following in a jar and refrigerate: oats, yogurt or milk, fruit, nuts or seeds. There are so many options that you can have something different every day of the week. Plus, it’s a great breakfast to carry to work. Enjoy this for dinner or put an egg on it for a fiber-full breakfast, protein-rich. If you use the Diabetic Exchanges, count 1 cup serving as 2 Starch, 2 Veg, 2 Meat and 1 Fat. If 42 grams of carbohydrate is greater than your meal allowance, trim your portion to ¾ cups for 31 grams of total carbohydrate. I've included recipe analysis below as a side dish as well as a breakfast entrée including an egg. The numbers in parentheses indicate the amount of nutrient in 1 cup of Savory Oats and Lentils topped with an Egg. Heat the pot over medium heat. Add the oil and swirl to cover the surface. Add the scallions, kale and mushrooms. Sauté until softened, about 5 minutes. Add the garlic, pepper and sage, and stir to mix the seasonings well. Add the vegetable broth. Increase the heat to bring the contents to a boil. Add the lentils and oats. Stir vigorously. Reduce the heat to medium low to obtain a steady simmer. Cover and continue to simmer for about 25 minutes until the lentils and oats are soft and the liquid is mostly absorbed. Stir occasionally to prevent sticking. If desired, top with diced scallions, Parmesan cheese, toasted cashews or toasted pine nuts. 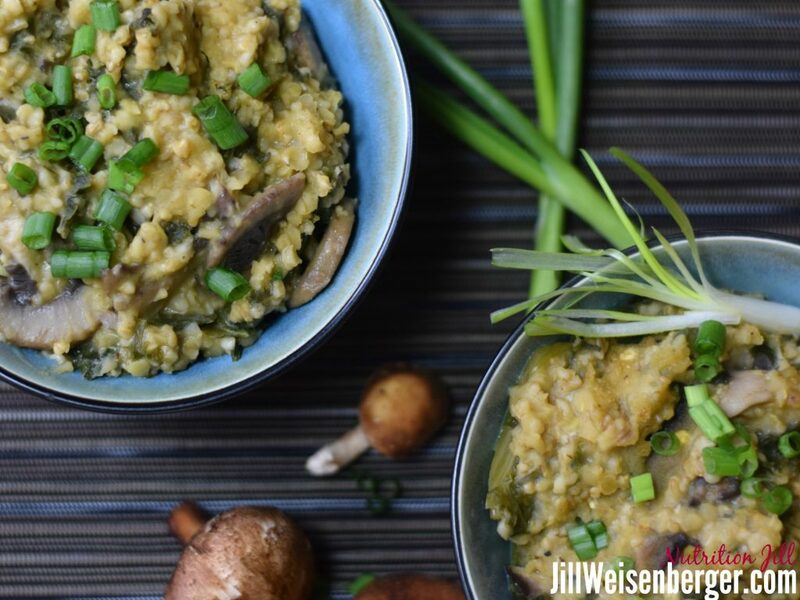 Do you have a favorite savory way to eat oats? You might be interested to learn a bit more. I just tried this last night, WOW it was good. I love mushrooms and this dish brought out the flavors and was very satisfying. Thank you for posting this one Jill! Thank you for the feedback! Funny, but one of my daughters is home now, so I made it for her tonight. We ate it as a main dish with a fried egg on top. We thought it was pretty delicious too. Let me know if you try the sweeter version with apples, cinnamon and cardamom. And thanks for sharing your experience. Fantastic! I was so ready for something new and different. Thank you! Oh, thank you for telling us. I agree. I love this recipe! This recipe is really unusual. And it works well. The flavors were perfect. It’s a keeper. Yay! So glad you like it. Thanks for saying so. Thank you! I sure hope you like. Nearly every time I make it now, I serve it with a fried egg on top and make it a light dinner. I didn’t start out to make it a main dish, but it’s turned into that.